Why does everything make me want to turn my head away from my goal?? Yesterday, I received a black and white squishy in the mail, and it was perfect! My only problem with this is that I only did 3 sets instead of 4. Now that I have the squares, I may have to enhance the design for my newest vision of the design, which is actually a problem that is solved after thinking about it for 3 months. I want to add applique on this, and had a dream about putting it over the top of some of these squares, but the squares are only 4 inches finished, and placing a slightly large applique on top wouldn’t seem fair to the poor squares that were behind. Here’s some designing thought process. 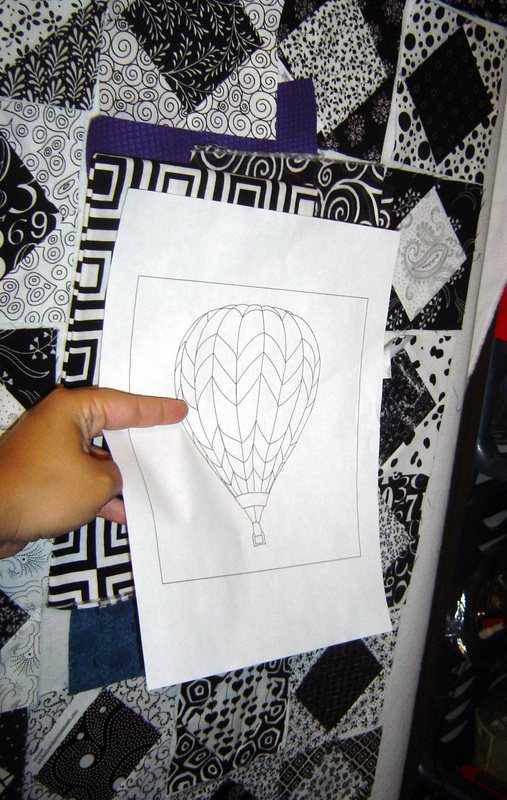 The balloon is wonderful, something I drew from EQ7. I blew up this size because it fits onto a piece of paper. I really should go bigger with this. Bigger little tiny pieces of applique are much easier to do and fold and layer than tiny ones. Ask me how I know. The little red applique above the blue is like an eighth to a quarter inch. 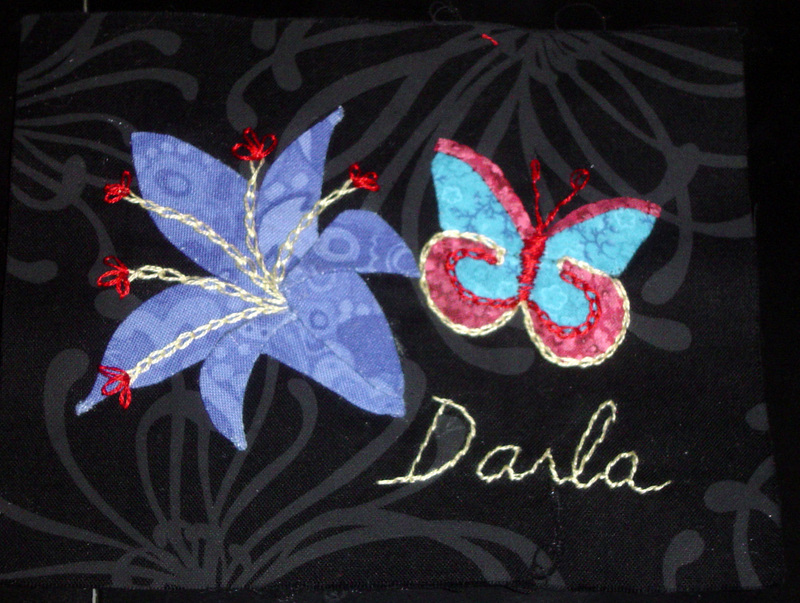 I had to hide the mistakes on the curved pieces with embroidered chain stitch. 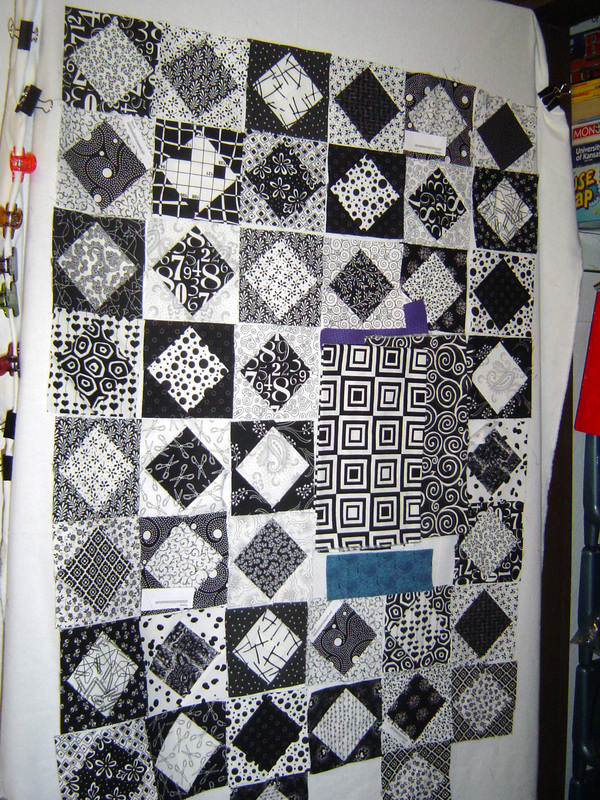 So, since I have this dilemma of wanting to put applique on top of black and white wonderful square in a square pieces, and I want to make the applique bigger, I am going to need a ‘substitute’ fabric to place in the quilt behind the applique piece. I have 2 fabrics that I like for this job (actually more than that), so if I made a square hole here, I could theoretically make a large square in a square block to fit the opening. This would keep with the theme of the piece, just play with scale a little bit. 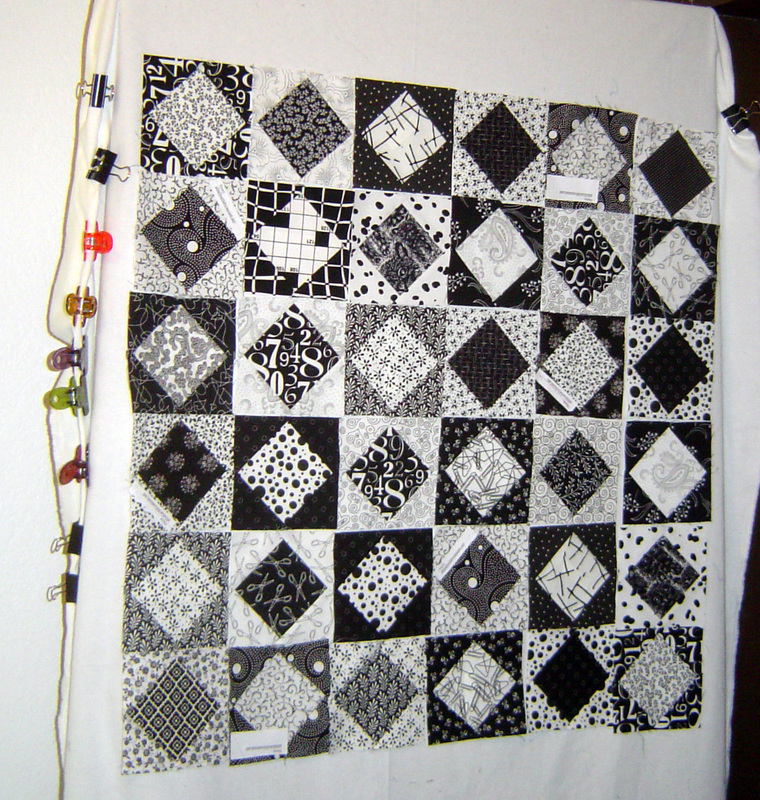 And if I made one very large square in a square piece, I could also potentially make another one or two. Adding more larger pieces easily makes this quilt larger in a hurry without being all ‘persnickety’ about all the seams being perfect. And it adds interest. And I don’t have to make a ton of other square in a square blocks to get a bigger quilt, and make an even bigger piece than I was originally imagining without a ton of effort. Here’s where I am headed with this piece. I will potentially frame the inset with the colors going into the applique. I want the applique to stay in the middle to the right in the picture. If I make a second larger square in a square, I want it on the opposite corner (for now). I may make 3-4 larger square in a square blocks and place the applique on top of them. It’s easy to figure the larger square in a square pictures because these blocks are 4 inch finished. So I’ll need an 8 inch finished block to do a double sized square in a square, or a 12 inch finished to one large triple sized block. In typing this out, it really helps the creative process. As one idea pops up long enough to concentrate on it to type it out, two more ideas pop up beside. Oooh! That’s what’s fun about this whole process!